A couple of years ago, I wrote a post for Three Guys One Book about a few favourite books in my life, one of which was Dorothy Ann Lovell’s In the Land of the Thinsies . 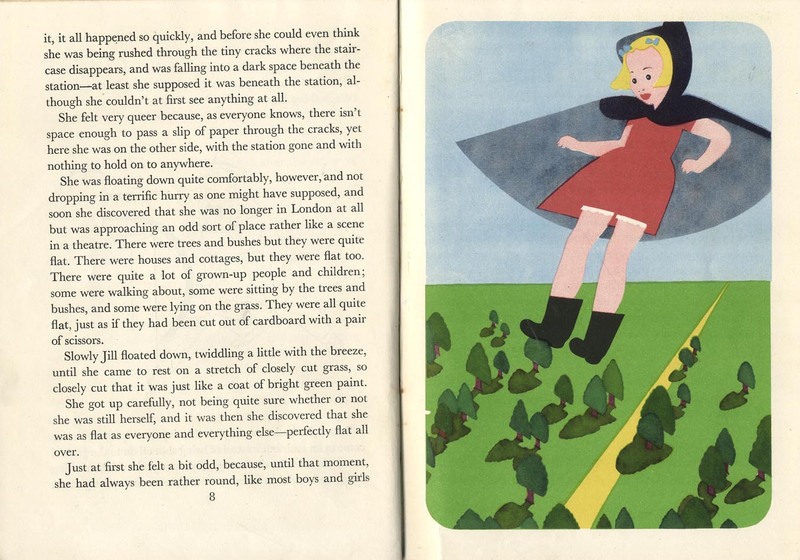 A forgotten children’s book with illustrations by Nicolas Bentley, it tells of a girl who neglects to get off at the end of a London Underground escalator, rolls through the crack, and is squeezed flat and shot out into a subterranean world where everything and everyone is as thin as a sheet of pastry. The copy I read (aged about 8) belonged to my mother, who says she has been nervous of escalators ever since. The impact on me was different. It was the first time I remember having that real science-fiction “sense of wonder”, the tingling effect of encountering a world that is almost familiar, and has a scientific rationale of sorts, yet is utterly bizarre, remote, and dreamlike. It left me with a lifelong fascination for underground worlds, flatlands, hollow earths and the like. When I wrote about it for Three Guys, I wasn’t able to find any illustrations online, nor a second-hand copy. I could only look at the copy in the British Library, and I found it a bit disappointing, as often happens with remembered marvels. But I have now just found some images on a brilliant site devoted to illustrated storytelling: Chris Mullen’s The Visual Telling of Stories. Beware: if you go there, you will probably lose yourself for hours. He gives us a number of double-page spreads from In the Land of the Thinsies, with illustrations and sections of narrative. I hope no one will mind if I post one here. (If anyone does, tell me and I will pull it back through the cracks). Do go to the site to look at more if you are intrigued. Funny: this time, looking at the images, it does seem marvellous again. How does that work? And here’s my FInancial Times review of this gorgeous book. They have an excellent gallery of Will Pryce’s photographs on the site. Read it and slaver. My old website was getting eccentric in its ways, so here is a new one. After tinkering with it for a few weeks, I am now about ready to give it it an encouraging pat on its nappy-clad backside and sending it toddling off into the world. Don’t fall over, little website! It will also be my new blog. But for continuity’s sake, here is a link to my previous one, Sarah Blogwell’s Bake.